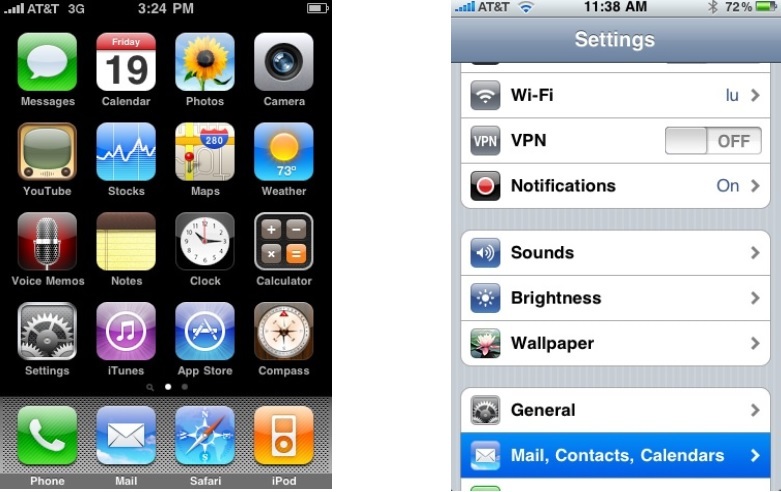 Examples shown are for iPhone OS Version 4 or later. Step 1: At the Home screen, tap the Settings button. On the Mail screen, tap Add Account. On the Add Account screen, tap Microsoft Exchange (Google uses ActiveSync technology). 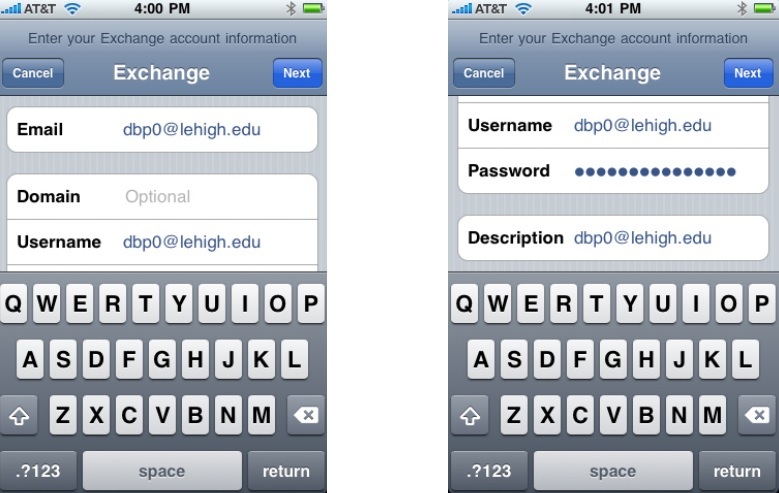 On the Exchange screen, enter your Lehigh email address in the form "userid@lehigh.edu" in both the Email AND Username fields. Leave the Domain field blank. In the Password field, enter your Lehigh Google Generated password. Be very careful to type this password correctly! 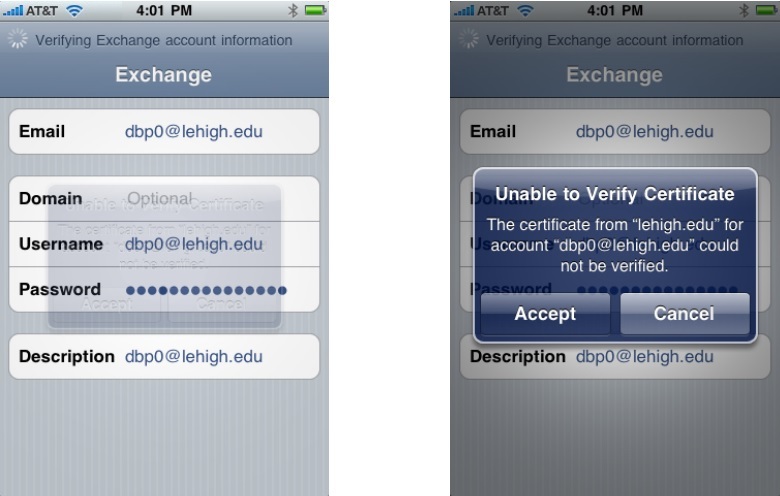 You should see "Verifying Exchange account information" at the top of the screen. You may be prompted to verify a security certificate. The Exchange screen withh change to show an additional field to enter called "Server". Tap the Next button at the top of the screen. 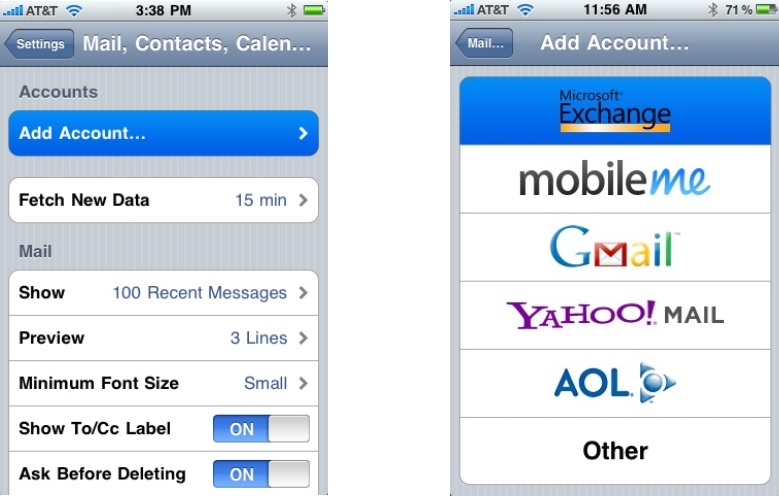 The Exchange screen will change to show On/Off switches for Mail, Contacts and Calendars. Slide Mail to OFF (Google does not support this option), slide Contacts OFF and keep Calendars ON. 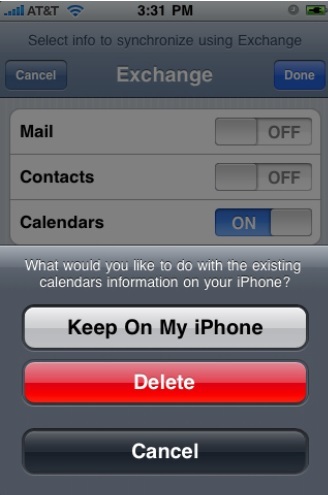 If you have existing Calendar or Contact data on the iPhone, you will be presented with a warning screen asking confirming that you want to Delete the calendar data on your iPhone. 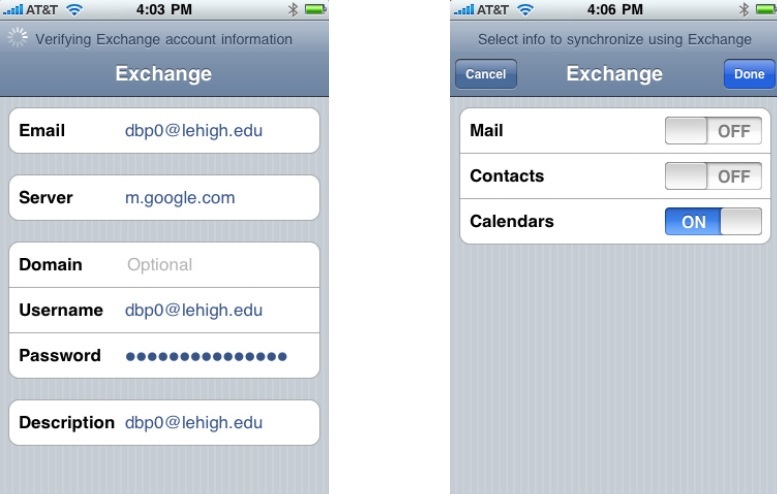 Lehigh Google Sync is now successfully configured for your iPhone! Synchronization with your primary Lehigh Google calendar will begin automatically if you have Push enabled (the default.) You can also open the Calendar app and wait a few seconds to start a sync. 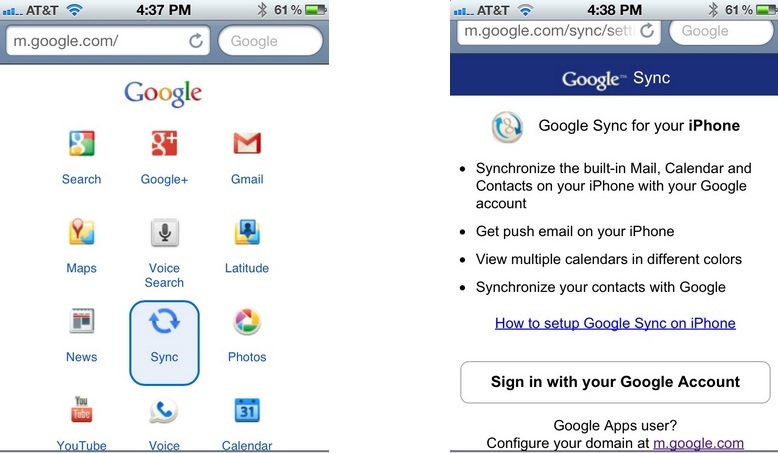 If you want to sync only one Google Calendar, stop here. To add more calendars, continue with the next steps. On the Google Sign In screen, enter your Lehigh username including @lehigh.edu and tap "Go" or the "Sign In" button. DO NOT ENTER A PASSWORD ON THE GOOGLE SCREEN ! 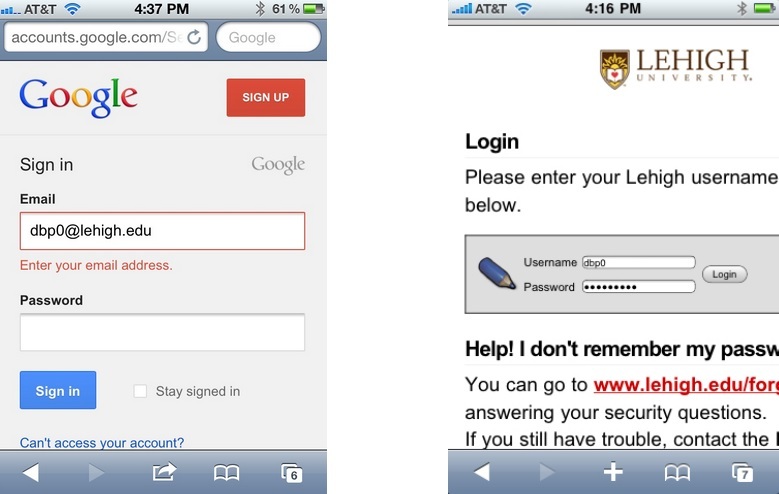 On the Lehigh Login page, enter your REGULAR Lehigh username and password (not your Lehigh Google generated password) and tap Login. 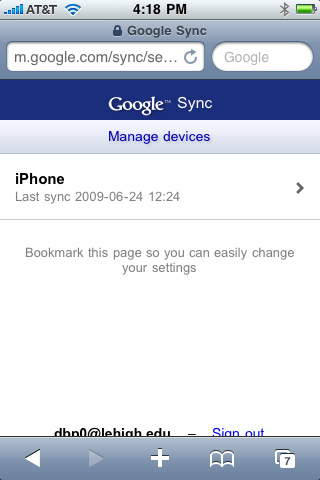 On the Google Sync screen, Manage devices, tap on the appropriate iPhone listing to choose it as a device you wish to sync. The final screen will show a list of your Lehigh Google Calendars and checkboxes, with your primary calendar checked. Check the boxes for calendars you wish to sync with this device. Synchronization with all selected Lehigh Google calendars will begin automatically if you have Push enabled (the default.) You can also open the Calendar app and wait a few seconds to start a sync.